Google form data comes into a spreadsheet nicely, but often it is only a small portion of the data that someone would like view. Below are some functions and tools that make sifting that data much easier. The filter button is a very quick way to only show certain fields. You can apply multiple filters to the data to show only what you want to see. 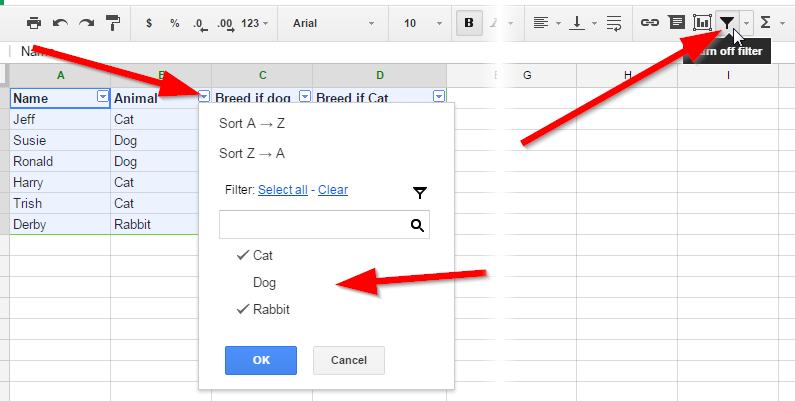 The filter formula is a more permanent solution to filtering data in a spreadsheet. The only catch is that it pulls all the columns. To use the =filter() formula on form data, you should create a new sheet. Enter the headers into the sheet that match the questions (tip: use =Form Responses 1!A1), then in cell A2 put your =filter() formula. The query formula works like the filter function, however it allows you to choose only the columns you want to view. This makes it ideal for creation displays of data that is only relevant to the viewer. The catch is that it uses SQL syntax which is not well documented in Google's documentation, but there is plenty on the web. Additionally this allows you to filter on a column that is not being viewed, allowing for better formatting for printing or viewing.